All too often I will hear someone from either coast talk about someone with a "Midwestern accent." In some annoyance, I want to say, "which one do you mean?" The "Midwest" is a large, diverse region, with a number of varieties of English. Even in one state like Illinois, there are several. In Chicago alone, we could talk about the influence of a variety of ethnic groups on English—African American, Russian, Hispanic, Polish, Italian, and more. But even outside the city, English varies, and in ways that we can easily map. In what follows, I want to talk about the way we can map English in western Illinois, which, unlike the Chicago area, is mostly rural. Please 'm, 'I go aout? That's whut I said. I want aout. The narrator intervenes: "at last she understood this Westernism, new to her. To "want out" is to desire to go out." What Anne, a northern Yankee, is confronting is a different dialect, one that actually impedes communication. As we will soon see, both Anne's and the child's dialects are still thriving in Illinois. We shall learn in a moment what these dialects are and where they come from. However, since I am going to talk a lot about "dialect" in this essay, we would do well to begin by defining this word—it is usually a loaded one. Linguists regard "dialects" as simply different varieties of the same language, but people outside of the profession often think that "dialect" means the way other people talk, sometimes in a manner funny or exotic, but in any case noticeable. We could map a boundary line separating Northern and Midland dialects, a line that persists from Pennsylvania clear into Illinois, into Iowa and beyond. This accounts for some of the most obvious geographical differences in Illinois English. Syntactical constructions such "the car needs washed" persist roughly south of Interstate 80, not only in Pennsylvania, but in Ohio, Indiana, and Illinois. And the differences are caused by settlement history. The area between Interstate 80 and the Deep South was settled heavily by Scots-Irish, who have left a number of items in their linguistic heritage. North of I-80, Yankees from western New England and northern Europeans (Germans and Scandinavians) brought different linguistic characteristics. But more about this important linguistic divide later; first let's get back to the work of definition. For another way to understand what we mean by "dialect," let's try to figure out what your own dialect is. Because you are reading this magazine, you are probably reasonably well-educated. That means your own speech is rather likely to conform to the dictates of editorial boards. You are most likely to make the past tense of "see," saw and not seen. You are likely to say "the wind really blew last night," and not blowed. Some other matters of grammar have more to do with where you live. Let's suppose you live somewhere north of Interstate 80 in Illinois. If I ask you if it is okay to say "anymore politicians are corrupt and crooked," you will probably say "no" (talking about the grammar, not the politicians!). And of course if I ask you the same thing about "the grass needs mowed" or "the cat wants in," you will once again say, "no." What about your "accent" or pronunciation? That is a little bit trickier. If you live in the northern suburbs of Chicago (but not Skokie), or in the smaller towns west of Chicago, and still north of Interstate 80, your pronunciation is probably very much like what you see in dictionaries of the English language published in the United States. less. You might also have this "northern Illinois" dialect if you live in one of the counties along the Mississippi east of St. Louis, Missouri (but not East St. Louis, Illinois). Up to this point, if I have described your dialect more or less correctly, you probably do not think that you have a dialect, meaning probably that you think you use "good grammar" and do not have an accent. But that's not true. You probably speak what we call the "Inland Northern" dialect. I grew up speaking this dialect in Sterling, Illinois. I hear people who talk like me when I visit many of the Chicago suburbs, or Madison, Wisconsin, or Ann Arbor, Michigan, or Cleveland. The same is true in upstate New York and extreme northern Pennsylvania. Although I now live in New Hampshire, where people talk very differently than I do, if I drive a couple of hours west to Vermont or a couple of hours south to Connecticut, people seem to sound "like me" - that is, they speak the Inland Northern dialect. Before we go any farther, let's consider why we "Inland Northern" speakers don't think we have an accent. Much of the English-speaking settlement of northern Illinois, in fact of the southern Great Lakes region, came from the northeast, especially Vermont and upstate New York. We can see artifacts of Yankee settlement in northern Illinois place names. In northeastern Illinois, there is Harvard, while along the Illinois-Michigan Canal there are New York names such as Lockport, Utica, Seneca, and, in the northern Military Tract, Geneseo. The settlers who brought these names tended to be relatively literate. They came from that Puritan heritage which taught that the ability to read the Bible was essential to salvation; they might have learned to read and write with the McGuffey's readers, which often used Bible stories and quotations for material. Teachers came from this group. The manuscript census returns for 1850 in Illinois, for example, reveal that a large percentage of those who listed their occupation as "teacher" were born in New York, Vermont, or other New England states. These teachers came to the frontier filled with missionary zeal, coming, as Catherine Beecher exhorted, to combat the "fearful scourge of ignorance" rampant on the frontier. New England clergymen were urged to come and "save the West for God." A good example of this "Yankee" settlement was Galesburg, Illinois, named for George Washington Gale, who led a group from Oneida County, New York, to found a settlement with a seminary, the ancestor of present-day Knox College. These Yankee settlers soon had the advantage of economy as well. Census records show that those born in New York or New England often dominated the ranks of professionals and businesspeople by the middle of the nineteenth century. At a time when subsistence farming was a norm, fewer "Yankees" than other types of people were found among the farmers listed on the 1850 census. And "Yankees" tended to have more dollar wealth than others. Inland Northern was the language of the schools, the educated, the prosperous, and the powerful. For this reason, it became the dominant dialect in the Middle West. Moreover, when the industrial base of the United States began to shift westward from New England into the Great Lakes region, Inland Northern became the prestige dialect of the entire country, replacing the Harvard-like accents of the Northeast. This is most obvious when we examine soundtracks of old movies, tapes of radio shows, and pronunciation manuals. In movies from the 1930s, actors with theatrical training often talked like people from the northeast, dropping the r's at the end of words, somewhat like the Harvard accents made famous by FDR and JFK. The same thing was true in radio. After World War II (when the industrial output of places like Detroit helped to win the war) actors and broadcasters (including those on television) were more likely to use Inland Northern. So if you speak Inland Northern, you still speak a dialect, even if it is a dialect that has received a lot of breaks from history. By the middle of the twentieth century, Inland Northern had become the dictionary norm as well. This particular change was aided by John Kenyon of Hiram College, Ohio, who promoted what was probably his own dialect, calling it "General American." Kenyon's American Pronunciation became a popular pronunciation guide in the 1930s, and Kenyon became pronunciation consultant for Webster's Second International Dictionary of the English Language. Inland Northern was for years called "General American" by speech manuals and speech teachers. Although the accent leapfrogged from the northern Midwest into the northern Pacific Coast and dominated in movies, TV and radio, it never really penetrated the high plains or the southern half of the country - in other words, it was never as "general" as was often assumed. job at Western Illinois University, I noticed that most of the men pronounced the name of our supervisor, whose name was "Ash," as /ay-sh/. As I settled into Macomb, I also noticed that some people pronounced "time" almost like "Tom" while, later, "face" began to sound like "fice" and "feel" and "steel" began to sound like "fill" and "still." Why this Southern influence, if that is what it is? What is important to remember is that western Illinois, at least the southern part of it, is dominated by two rivers, the Mississippi and the Illinois, and tributaries like the Sangamon, the LaMoine, and the Spoon. Until the coming of the railroads and highways in the mid-nineteenth century, the rivers dominated settlement, and ultimately the ways people made money. That meant western Illinois was settled by people from the Border States as well as the older southern states—Kentucky, Tennessee, western Virginia, North Carolina, and Maryland—where woodlands remained part of the economy. So the first English speaking people to settle western Illinois in large numbers spoke with the accents of these places, and southern place names in the area testify to this migration—Tennessee in McDonough County, and Virginia in Cass County, for example. However, not everyone in western Illinois speaks with anything like a southern accent, and not all English speakers came from the South. After 1850, with the completion of the National Road from Pennsylvania to St. Louis (roughly the route of Interstate 70), a wave of settlers came from Ohio, with ancestry largely in western Pennsylvania and ultimately from Ulster. This newer wave of settlers came to the prairies, which the southerners had avoided, but which were now becoming accessible with the building of the railroads. The prairies of eastern Illinois — especially Champaign, Ford, Piatt, and Iroquois counties — received the heaviest concentration of Ohioans, but plenty came to the Military Tract as well. Sciota, in northern McDonough County, is probably named for the Scioto River in Ohio, with the spelling changed to reflect common pronunciation. And a few Yankees arrived as well, not only in cities like Galesburg but in smaller communities where teachers, bankers, or merchants were in demand. 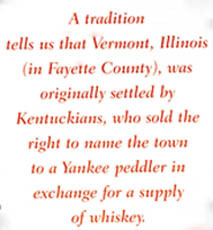 A tradition tells us that Vermont, Illinois (in Fayette County), was originally settled by Kentuckians, who sold the right to name the town to a Yankee peddler in exchange for a supply of whiskey. Thus, we might expect that the original Southern dialects of the earliest settlers might be modified over time. I found some verification for this when I examined vocabulary records from Colchester, Illinois, which were collected during the 1950s for the Linguistic Atlas of the North Central States. A woman born in 1876 to Irish parents, for example, used these words which are associated with the Southern dialect: hay loft for a place to store hay in the barn, light bread for white bread made from wheat flour, shucks for the leaves on an ear of corn, hay shocks for a pile of hay in the field, belly buster to describe going downhill on a sled on one's stomach, French harp for a harmonica, and pallet for a bed made up on the floor. However, a man born in 1894 used the Northern terms hay mow instead of hayloft, husk instead of shucks, and haycock instead of hay shock. Among other records I examined, this same trend seemed to hold — some Southern words persisted throughout, like branch for a creek, or pallet, but the numbers of Southern words declined somewhat and Northern words became more common among people with later birth dates. Among all respondents, moreover, we find evidence of Scots or Irish Gaelic. Several of the respondents used "clabber" for sour milk, or 'clabbers cheese" for cottage cheese. And, of course, constructions like "the car needs washed," another leftover from Ulster Scots, is common to this very day, as is "I want off," "the cat wants out," or, recalling the example from Kirkland's novel, "I want out." 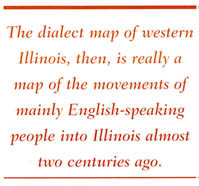 Thus, the most noticeable change in dialect, as we move from north to south in Illinois, is the shift from a pronunciation somewhat like what we find in dictionaries to more of a Southern accent. However, there are many exceptions to this general rule. For one thing, within northern Illinois, including the northwest part, there is some variation in pronunciation and grammar. My father, of Pennsylvania ancestry (although not "PA Dutch"), jokingly liked to say "the oranges are all." (He also knew some German, which he learned at Mon-mouth College.) Some people in Sterling called cottage cheese smearcase, like the Pennsylvania Germans, while others called it Dutch cheese, as they did in New York State. However, the greatest influence from Pennsylvania came from the western part of that state by way of Ohio (that is, Ohioans of Pennsylvania ancestry). As mentioned earlier, the Ohioans filled in the open spaces on the prairies and spoke with some of the Gaelic influence on grammar mentioned earlier ("I want out," "the baby needs fed") but without the Southern accent. One pronunciation feature, however, that I believe is of western Pennsylvania (and probably Scot-Irish) origin is the very strong "R" in words like hurt or thirty. This feature is common in much of Illinois outside the Chicago area, and is working its way south. German settlement also complicates the linguistic geography we find farther south. and we are even more likely to hear it across the Mississippi River from Quincy, in Missouri. But much of the settlement of Quincy itself was Yankee, and the Yankees were joined by large numbers of Germans. Germans tended to be relatively well-educated immigrants who went to school and learned English from Yankee teachers; thus, Germans were less likely to have a Southern accent when they spoke English. For this reason, Quincy English sounds less Southern than the surrounding countryside. (The same is true of St. Louis, farther down river.) I have had students at Western Illinois University who grew up in Quincy tell me that kids from Hannibal, Missouri, just across the Mississippi, were "hillbillies" — because of the way they talked. Throughout this discussion I have mentioned Interstate 80 as a kind of rough linguistic boundary. I should here mention that this has nothing to do with that twentieth-century highway itself, but rather the route it follows. In the east, it follows natural geographic features; in Ohio and Indiana, it skirts the Great Lakes. In Illinois, it follows the course of the Illinois River before that river turns south just past Spring Valley, then it follows ancient Native American migration routes taken from Lake Michigan to the mouth of Rock River on the Mississippi. That is a natural boundary. And the prairies themselves were boundaries to the early Southerners (who avoided them) just as the Illinois and Mississippi were natural south-to-north migration and settlement routes for those same southern settlers. So we find Southern accents in the river valleys, except in urban areas like those of St. Louis or Quincy, where Yankees and Germans favored the Inland Northern dialect. Once we reach Rock River, however, whose mouth is close to I-80, we find one more barrier to Southern settlement: Native Americans. The Rock River valley opened to white settlement only after the Black Hawk war of 1832, by which time the opening of the Erie Canal in New York opened the West to Yankees, and later, Pennsylvania Germans and then Germans from Europe. Timothy C. Frazer retired recently as a full professor at Western Illinois University. Currently he is an adjunct tutor at Magdalen College in Warner, New Hampshire.